Featuring the melodious Rucha Muley Jambhekar! Rucha is an extremely talented and versatile musician blessed with a powerful voice and an incredible range traversing three octaves. She makes extremely difficult vocal techniques seem effortless. 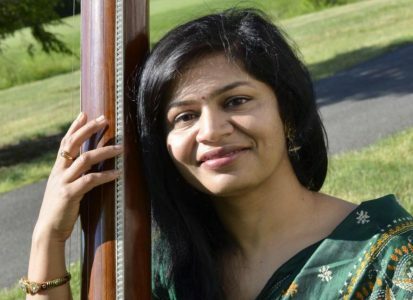 She has been been learning Hindustani Classical vocal since she was 7 years old and obtained training in Kirana Gharana gayaki in her formative years. She credits her Guru Arati Tai for showing her a world where each ‘Swara’ has a different color and a different interpretation according to the personality of the Raga. … my confidence to pursue music as a full time profession can be solely attributed to my Guru and role model Vidushi Arati Ankalikar Tikekar. She has exposed me to new dimensions of music and has given wings to my thoughts and creative process. Read below about Rucha’s favorite Fellowship productions and why she enjoyed working on them. Learn more about Rucha and her music at her Facebook Page.